^ English is the official language of 32 states; English and Hawaiian are both official languages in Hawaii, and English and 20 Native American languages are official in Alaska. Algonquian, Cherokee, and Sioux are among many other official languages in Native-controlled lands throughout the country. French is a de facto, but unofficial, language in Maine and Louisiana, while New Mexico law grants Spanish a special status. ^ Not including Hispanic or Latino ethnicity, see Race and ethnicity in the United States for more information. ^ Whether the United States or China is larger has been disputed. The figure given is from the U.S. Census and United Nations. ^ Except American Samoa and the Virgin Islands. The United States of America (USA), commonly referred to as the United States (U.S.) or America, is a federal republic composed of 50 states, a federal district, five major self-governing territories, and various possessions.Forty-eight of the fifty states and the federal district are contiguous and located in North America between Canada and Mexico. 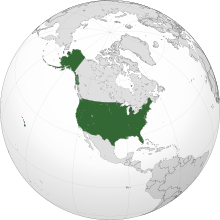 The state of Alaska is in the northwest corner of North America, bordered by Canada to the east and across the Bering Strait from Russia to the west. The state of Hawaii is an archipelago in the mid-Pacific Ocean. The U.S. territories are scattered about the Pacific Ocean and the Caribbean Sea. Nine time zones are covered. The geography, climate and wildlife of the country are extremely diverse.